Playniac's vision of a robotic dystopia is an extremely fun card-based strategy game. Our intrepid robot hero Franklin is sent to the "arenas" just for asking questions, apparently after having his memory wiped. He can't remember anything that he's supposedly done, but he's being forced to fight other robots to the death as punishment for his wrongdoing. That's where you come in. You're now Franklin's ally as he works to figure out what's going on with his seemingly vanished memories as well as the arenas he's now forced to fight in. Poor Franklin! Luckily, combat is the name of the game with Insane Robots, and it's one of the most addictive twists on card battling mechanics I've seen. To play against other robots, you'll take part in Tournaments. 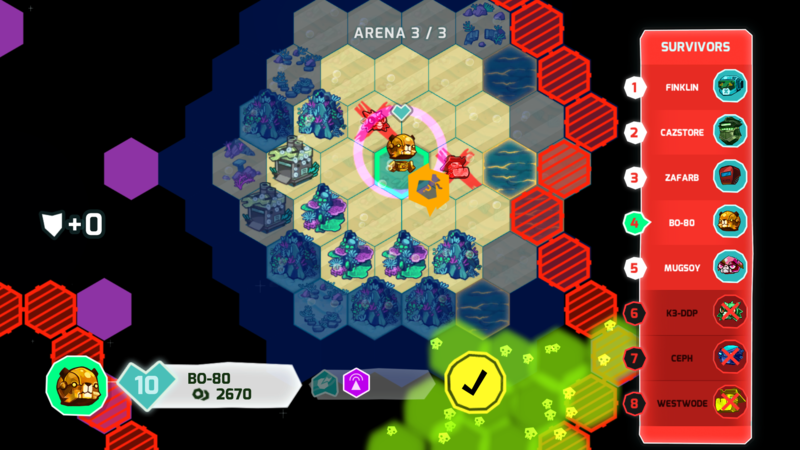 Tournaments find you matched up with various other robots on a grid with hexagonal squares covering each type of terrain. You get a set number of moves allotted to you for each turn, and you can stop at stores, pick up special items, or duke it out with other robots as they make their way closer to you. When you do match up with a robot who dares take you on, a heated battle ensues. All combat takes place on a separate screen that begins with various empty circuits. Both parties must fill these circuits with "chips" to complete them, which takes energy. 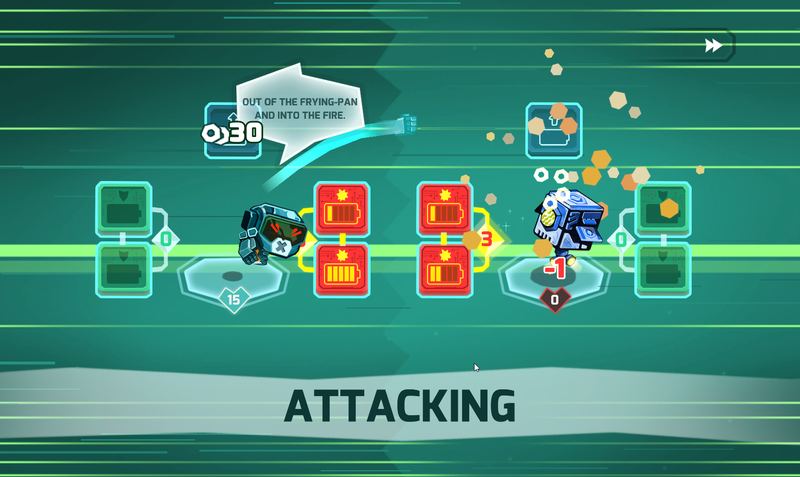 You must fill both attack circuits to complete them, same with defense. Once both are full, you can complete your turn with a damaging blow, or spend the rest of your energy swapping out chips or playing others. For instance, you might want to play a "glitch," which can reduce your opponent's defense or attack rating, or raise your own. These are tricky, since you can have them played on you as well. Sometimes, it's more prudent to use them to beef up your own stats, but others it might be better to reduce the other robot's attack rating so you can live to fight another day. But you're not always vulnerable to these tricky tiles that can very quickly turn the tides of battle. You can always opt to place a "lock" tile on one of your stats, such as your offense or defense cards, so your points will be locked in place and no longer susceptible to any glitches played against them. There's a variety of ways to craftily shield yourself from your opponents' moves. Sometimes, however, enemies can hide their attack and defense ratings, and you won't have any idea what kind of power you're up against. That certainly adds to the challenge, but only makes tearing through enemies even more satisfying when you do manage to come out on top. As you complete various tournaments, you'll unlock other robots, ranging from adorable catlike 'bots to more hulking monsters that look far more imposing. You can also spend the hard-earned currency you earn after each tournament on upgrades, such as attack and health boosts and other augments. You'll also need to purchase additional slots to place these upgrades on, which adds another layer of strategy to the game. Do you upgrade your defense or buy a disposable item that might increase the likelihood of drawing more attack tiles? It's all up to you, and befitting of your own personal play style. All in all, the game offers some hilarious cut scenes, adorable robots, and fun quips between attacks. It's also some of the most engaging and exciting card battle gameplay I've seen in quite some time, serving up an easily accessible mixture of strategy and card-based attacks, which will reel you in almost instantly. I know I'm excited to see even more than the preview build allowed. Insane Robots is targeting a Summer 2018 release, but there doesn't appear to be a solid release date just yet. It's well worth keeping an eye on, however, so we'll be back with additional coverage once it's finally made its proper debut.